The glitzy Daesong mall in Pyongyang reopened on Sunday after extensive renovations, the official [North] Korean Central News Agency reported. KCNA pictures show displays of high-end foreign home electronics at the mall despite international sanctions banning them, including products by Philips of the Netherlands and Bosch of Germany as well as China's Midea. 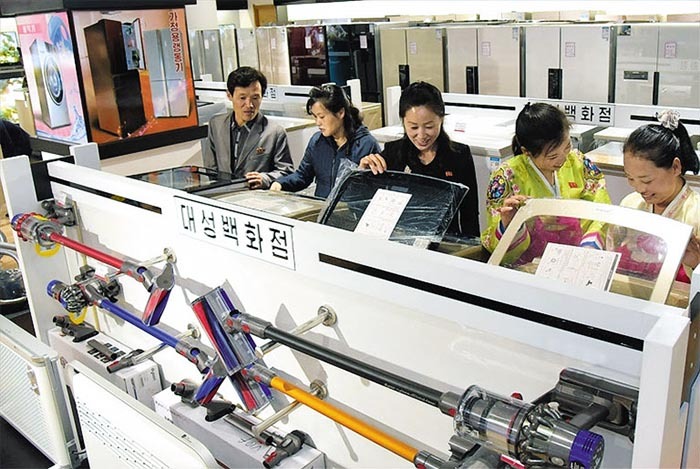 North Koreans look at home appliances at Daesong mall in Pyongyang on Sunday, in this photo from North Korean propaganda website Uriminzokkiri. Last week, leader Kim Jong-un declared himself "satisfied" as he toured the mall ahead of its reopening.